Last month, NASA announced that Curiosity rover had wrapped up its work at Mars’ Vera Rubin Ridge and would be making its way to a clay-rich region near the Red Planet’s Mt. Sharp for additional work. In an update on that mission last week, the space agency shared a panoramic image captured by Curiosity’s MastCam at the ridge drill site before it left, as well as an interactive video of the area. Curiosity’s last drill site on the ridge is known as ‘Rock Hall,’ and it’s located relatively close to the ‘clay-bearing unit’ that researchers will study next. A panorama from the Rock Hall location was created using images captured by the rover before it departed the site. NASA also published a 360-degree video from the images and annotated a few landmarks in it, including Mt. Sharp in the distance. Visible near Mt. Sharp is the clay-rich region, now called ‘Glen Torridon,’ where Curiosity will help researchers uncover more details about Mars’ landscape and history. The rover is equipped with multiple cameras, including the MastCam and the Mars Hand Lens Imager (MAHLI), which is attached to its robotic arm. 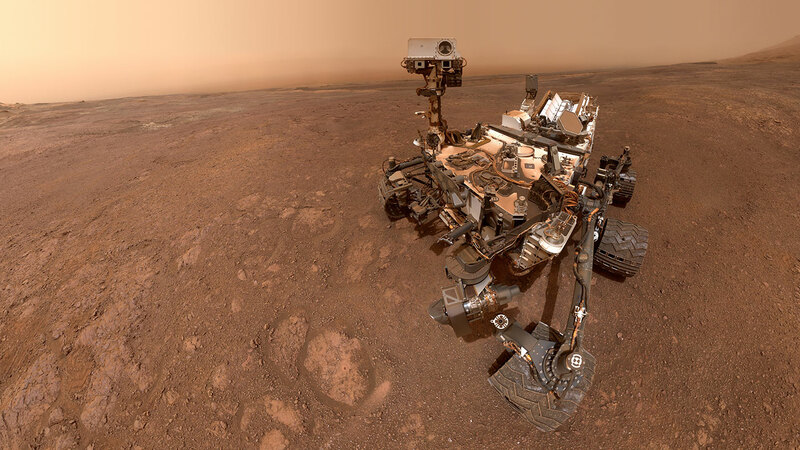 Last month, NASA shared a stitched image of the full Curiosity rover at the Rock Hall drill site; that image is made from 57 individual images that were captured using the MAHLI camera. The ‘selfie’ features the final Rock Hall drill site in the bottom center of the image.